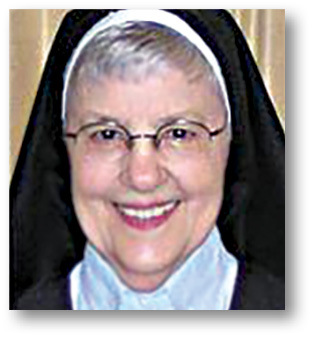 Sister Mildred Guillot (formerly Sister Francis of Assisi) CSJ died at Our Lady of the Lake Regional Medical Center on Nov. 22 at age 92. She was born in Natchitoches on October 17, 1926 to the late Leo and Norma Hill Guillot. She is survived by her sisters Betsy G. Roark and Mary Lee Guillot; her nephew Frank Roark of Orlando, Florida; and her nieces Rebecca Wall of Daytona, Holly Gordon of Orlando and Erin Rinker of Coco Beach, Florida. Sister Mildred was predeceased by her parents and her twin brother, Msgr. Leo Guillot. She entered the Sisters of St. Joseph in New Orleans on Sept. 8, 1943 after graduating from St. Joseph’s Academy in Baton Rouge. She professed first vows in in 1945 and made her final profession in 1948. From 1945 to 1949 Sister Mildred taught elementary school at St. Joseph’s Academy and Sacred Heart in Baton Rouge and at St. Rose in New Orleans. She attended Hotel Dieu Hospital Nursing School in New Orleans from 1949 to 1952 where she earned an R.N. The funeral Mass was celebrated Dec. 3 at Sacred Heart of Jesus Church in Baton Rouge. Interment was at Roselawn Cemetery. Memorial contributions in Sister Mildred’s name may be made to the Sisters of St. Joseph, 3134 Hundred Oaks Avenue, Baton Rouge, LA 70808.